Click here for order form ... or email me here. by Cole on one of the principal streets of Rockingham, late today. pistol on his desk. He was taken immediately to his home in the suburbs, accompanied by a physician. Ormond was dead in ten minutes, one bullet from the .32 pistol having pierced his chest. morning for a hearing before Judge McElroy on petition for liberty under bond. and former pastor in this town, and was not married. He lived at Nashville, NC. act, though it was reported tonight that he objected to attentions paid his daughter by Ormond. This is a 6 x 9 inch soft cover publication with 116 pages, and a comprehensive index. 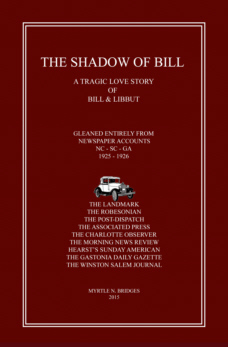 with the murder on E. Washington St. and ending in Wake County on June 17, 1926 with a final monetary settlement.